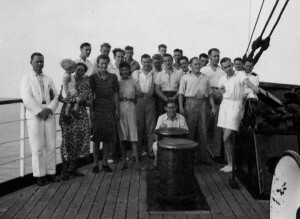 The Straat Soenda voyage of May 1940, brought the party of Dutch volunteers, depicted here at the bow of the freighter m.v. Straat Soenda, from South Africa to the Netherlands East Indies. The photo was taken shortly after departure from Durban, on 26 May 1940. The Straat Soenda reached Tandjong Priok, the harbour of Batavia (today’s Jakarta), on 11 June 1940. This group of 16 volunteers was accompanied byÂ two wives, one grandmother and an infant (me). The seventeenth volunteer (my father) took the photograph. Also portrayed are thought to be the captain of the Straat Soenda, Jozef Veldhuis. News of the departure caused a minor diplomatic row between Japan (with its army of a million) and the Netherlands East Indies Government with its army of 70,000. 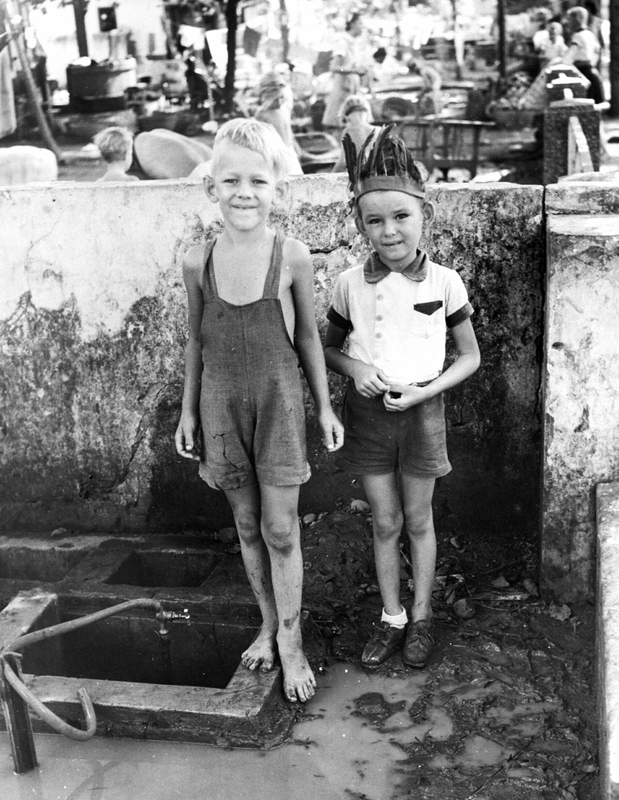 This was the first group of volunteers to arrive in Indonesia, followed by about two hundred more individuals. The passenger lists of the Straat Soenda is lost to the best of my knowledge. The author has been able to identify with the help of Tony van Kempen, a fellow KNIL volunteer from South Africa who became a fighter pilot, a few of the passengers: John Fisher, Bessy Fisher, his wife, Lt Col. Rein Jessurun , whose wife, Elizabeth Jessurun de Does, followed at later date and was later interned with us in Tjihapit. Also identified were Justinus Jacob Leonard Heldring, and Helmer Siegers. Not mentioned in this list was my own family. 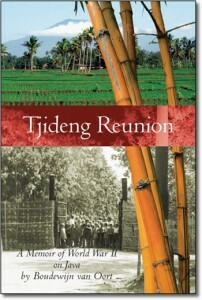 The book Tjideng Reunion includes a brief account of the fates of those traveling companions, as well as a description of the voyage and the remarkable, bittersweet welcome we had upon arrival in the Netherlands East Indies. The KPM freighter M.V. Straat Soenda, had room for twenty passengers. It was named afgter the narrow Sunda Straits that separates Java from Sumatra. The KPM fleet, based on Tandjong Priok in the Netherlands East Indies, ran a regular service between that port and destinations elsewhere in the Indian Ocean, such as Durban and also to destinations along the East Asian shore as Hanoi and Hong Kong where this photograph is taken. Smaller vessels of this company served the needs of the numerous islands of the Netherlands East Indies. The ship was newly constructed when war broke out, and survived the war.